District Institute of Education and Training, Pampore or DIET Pampore is a government educational institution under the nodal agency State institute of education-Kashmir (SIE) DIET Pampore was established in the year 2008 as District Institute of Education ( DIE) with the twin objective to conduct short term orientation courses for in service teachers and to impart one year training course of Diploma in Elementary Education( D-El-ED) for untrained, undergraduate teachers. Establishment of DIET's in every district of India with the financial support from the Central Government is based on the recommendation of National Policy on Education 1986. 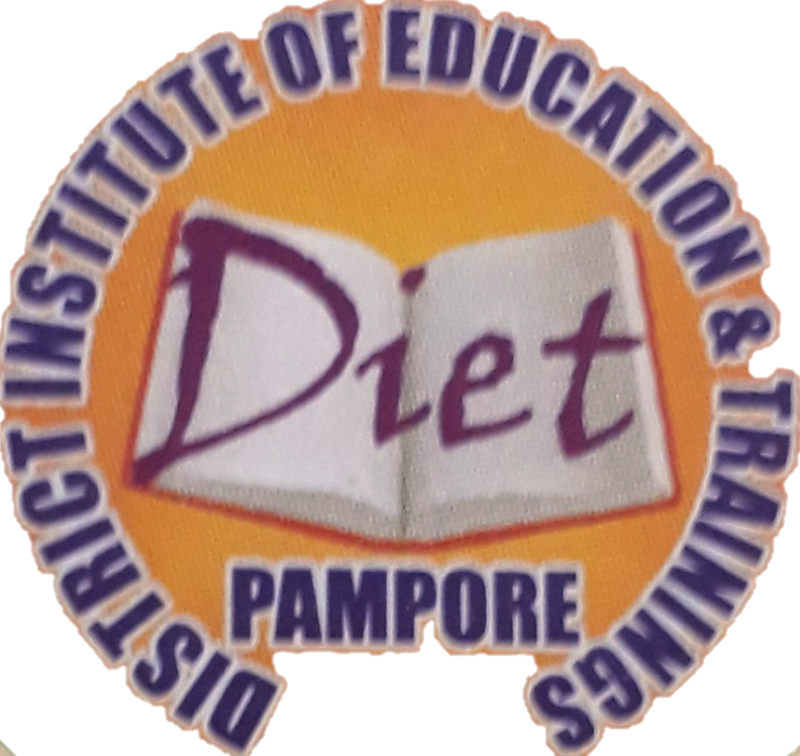 DIET serves as the third tier of training and resource support structure at the district level after NCERT at national level and SIE at State level. The function of DIETs at the grassroots level in the area of elementary education can be synopsized under these three points. Academic and Resource Support to the elementary and adult education systems in the district by developing locally relevant materials such as teaching aids, evaluation tools etc. and by providing services of a resource and learning center for teachers and instructors. It also serves as evaluation centre for primary and upper primary schools as well as Non Formal(NF) and Adult Education Programme(AEP). •	Action Research and Experimentation to deal with specific problems of that district in achieving the objectives in the areas of elementary and adult education and encouraging students for research and development.In order to achieve the educational upliftment of the district, DIET, Pampore has continuously been conducting a series of surveys and reviewing the targets achieved during the preceeding year . In this whole process due weightage is given to the requirements and aspirations in the field. Meetings are arranged with the educational functionaries of the district from Chief Education Officer down to the elementary school teachers well at the beginning of the financial year. This result in appositive interaction and on the basis of the outcome of these discussions and surveys, an Annual Action Plan, earmarking all the proposed programmes is chalked out. The action plan thus prepared is discussed with and got approved from SIE, Srinagar. An all-out and joint effort is made for effective implementation and monitoring of these programmes. The staff members are entrusted the task of supervision of these activities on rotational basis under the command of the concerned HOD and the Principal. A continuous flow of information and feedback is received by keeping a close liaison with the field. All the programmes and activities are performed strictly in accordance with the approved Action Plan. There is one year regular programme of D. El. Ed course for untrained undergraduate teachers. The teachers are deputed on the seniority basis to the DIETs for undergoing this diploma course. Besides D.ed, two year B.ed programme of IGNOU is coordinated by the institute for inservice graduate and post graduate teachers. Moreover DIETs have occupied a focal position in Monitoring of several components/ interventions under SAMAGRA. In order to supplement and facilitate the DIETs some sub-district structures like ZRCs at Zonal level and CRCs at cluster level have been established which facilitate our DIETs in flow of information and monitoring and Evaluation. For talent search the DIETs have a yearly programme of Science Exhibition and conduct of frequent Debates, Seminars, and Paper reading Contests. In science exhibition all children including the students of private schools are asked to prepare Models/Modules on the Theme suggested by NCERT. It may not be out of place here to mention that Children from J&K state have got several positions and Prizes. DIETs also prepare modules on instructional material and conducts surveys on Out of school children, Drop out children and conduct research on subjects like causes of low literacy, causes of low achievement and other educational areas.